This open call invites you to participate with your own idea/ artworks. Please apply to this call until December 23 2018. 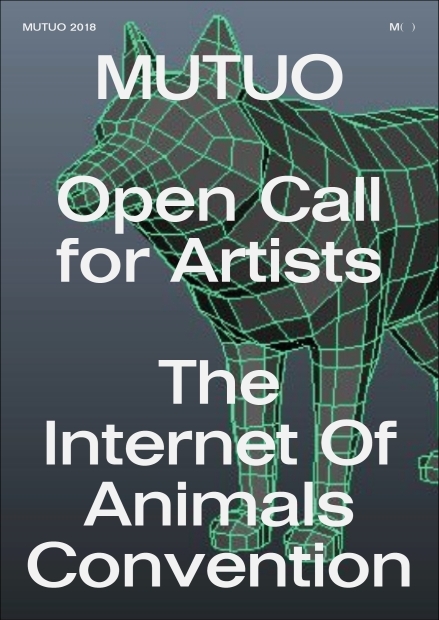 MUTUO GALERIA (OPEN CALL) - "The Internet of Animals"
¿Qué pasará cuando los humanos empiecen a conectar animales a internet? ¿Similar a las computadoras, las cámaras, los detectores de humo, los refrigeradores o los humanos? Un mundo fascinante (o aterrador?) Para imaginar. La exposición 'The Internet Of Animals Barcelona 2019' mostrará lo que los artistas imaginan. Estará acompañado por algunos elementos de "convención" para crear un evento que será ficticio y real al mismo tiempo. De esta forma, las obras estarán expuestas no solo a personas interesadas en el arte, sino también a personas intrigadas por el tema en sí. A) Creas algo independiente, inspirado en la trama, como se indica arriba (Internet de los animales). Por favor, aplique con el concepto primero. B) Descubres que algo que ya creaste tiene un significado (nuevo) en el contexto de la trama. Por favor contáctenos directamente con material explicativo sobre el trabajo. C) Usted participa en un programa especial de colaboración experimental del proyecto, comenzando con un impulso más detallado del proyecto. El camino hacia el resultado será uno de los impulsos entre usted y el proyecto. En este caso, póngase en contacto con FUFF / Ifuz para hablarlo. El trabajo pueden ser objetos, imágenes, etc., pero también algo interactivo. Condiciones: El transporte corre a cargo del artista. Las actividades del proyecto van más allá de este evento, por lo que es posible presentar algunas cosas adicionalmente o alternativamente más adelante o en otra forma. El Background del Proyecto: Ifuz es iniciador de 'El Internet de los animales' y plataformas experimentales como Experimental Bureau (e57.org) * y FUFF **. - * El Buró Experimental, originalmente ubicado en Frankfurt, proporciona ideas y plataformas experimentales. - ** FUFF es una universidad experimental abstracta, una forma complementaria de investigación y estudio en la que a menudo se involucra el arte. A) You create something independent, inspired by the plot, as headlined above (Internet Of Animals). Please apply with the concept first. It is not yet known how many applications will be submitted and how the entries fit together and how they fit into the exhibition space. B) You discover that something you already created does have a (new) meaning in the context of the plot. Please contact us directly with explanatory material on the work. C) You participate in a special experimental collaboration program of the project, starting with a more detailed impulse from the project. The way to the result will be one of impulses between you and the project. In this case contact FUFF/Ifuz instead to talk it through. The work can be objects, visuals, etc., but also something interactive that has its place in the 'convention' program. However, there can be no guarantee of participation: There are limitations of space, compatibility and other factors, some of which are still unknown (as we don't know the applications yet). The transport to and from the site must be done by yourself. The activities of the project go beyond this event, so that it is possible to present some things additionally or alternatively later or in another form. The concept of this 'convention' is an open platform/stage. People or initiatives can plug in with their own concept or let themselves be inspired in a dialogue, exchange, or cooperation with FUFF. It can be an installation, a presentation, a workshop, even a whole sub-project, like a makers or children day. Let yourself be inspired from the topic, think of an idea and contact me about it. That should be ideally be until December 15. Or: make contact first and develop something in exchange with FUFF. Artists are continually invited to develop their visions on the topic (in the form of inspired artworks). Their enigmatic visions, formulated in their own language of representation, serve as access to a reflective and self-surprising discourse. And they even lead to concrete ideas and innovations. This exhibition is linked to a new open call for contributions from local artists and possible additions by international artists. The exhibition is not only aimed at those interested in art, but also evokes curiosity and intrigue among passers-by, thus stimulates a subsequent discourse within and outside the project. For this purpose, the exhibition is continuously accompanied and contains some special trigger elements. This module, like the art module, includes an open call, too. Plug in with your concept of workshops, presentations, interactive modules. A hypothesis is presented as an introduction. This can take the form of a conceptual metaphor describing technological change. Or it may be a bold or bizarre idea of how to connect a particular animal to the Internet. "Can we be artificially happy? ", "How dogs now can give each other orgasms over distance", "Improving the quality of life of the Wifi-chicken through data science". specials: maker day? animal day? children day? - The Internet Of Animalsis a FUFF project, initiated by Ifuz and maintained with the help of many more. Very special thanks to Dirk Engel and his 'Zukunft der Medien' project! - FUFF is an abstract experimental university platform, a complementary idea of research and studying, enabling you to experiment with new forms, new contents, and new goals of studying. - Ifuz. I started experimental platforms like the Experimental Bureau and FUFF, and the 'Internet Of Animals' project at FUFF. I continue to support this project. I think it is a great inspiration.